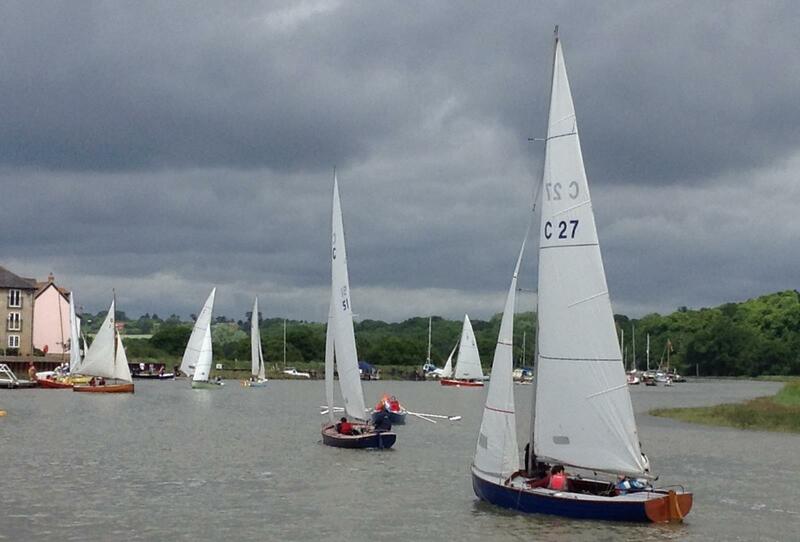 ← Wivenhoe Regatta Coming Soon! Ten BODs Enjoy A Fabulous Rowhedge Regatta Day! 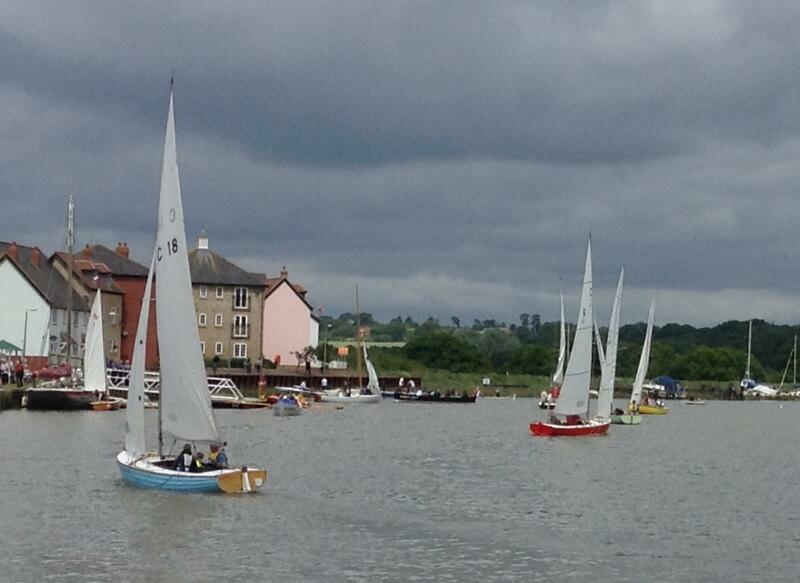 What a great day was had by all on Saturday for Rowhedge Regatta. With ten BODs coming to the Bateman’s start line it was to be a brilliant day’s racing with lots of place changing in the tricky light conditions at the top of the river where the mud, and peoples’ inability to avoid it, also played a role in the final finishing orders. 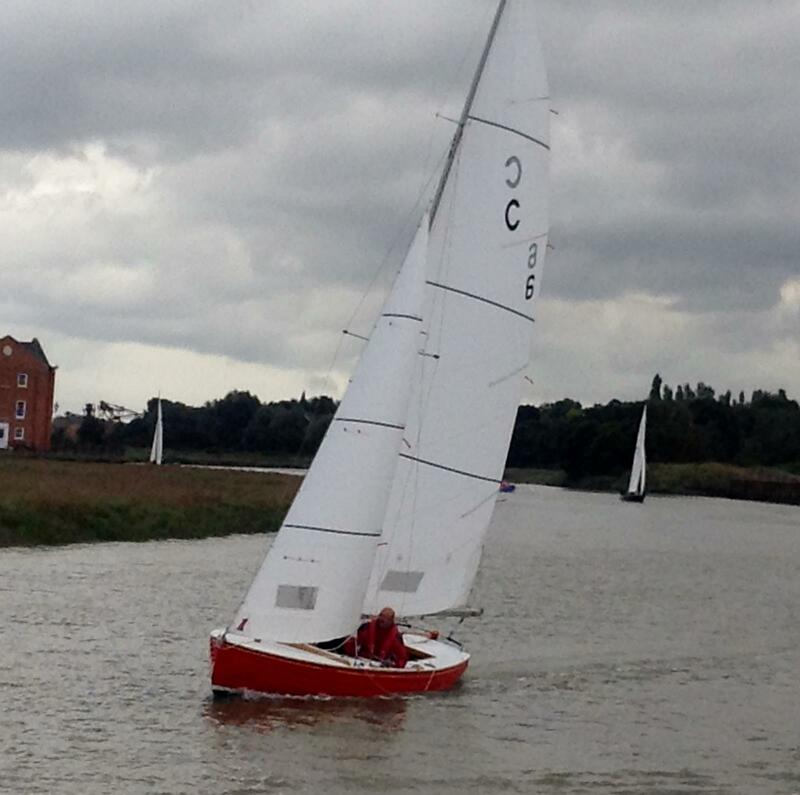 With races both up to Rowhedge and back downriver there were two chances for everyone to shine. The Upriver start off Batemans’ Tower caused a little confusion as the Smacks were finishing during the BOD starting sequence which meant the sound signals were a bit tricky to interpret, but despite this the fleet was soon underway on a course which took them out to number 13, back around Mersea Wreck and then up to Rowhedge. Sadly the sun was hiding but the early morning drizzle had abated and conditions were improving with a light northerly breeze to keep the boats moving nicely. Chris Rust, helming Dulcet in father Phil’s absence, got off to a flying start and led the fleet from the off with Danny Fox in Egret and Alan Hicks in Storm Petrel in hot pursuit. Tom Sargent was also having a fabulous day in Jumbo Too and initially Bob Richardson and his team in Panic were looking hot to trot too. Although Tom was able to hold his ground all the way to Rowhedge things didn’t go quite as well for Bob and you can read in his hilarious account of the day by clicking here. Whilst the leaders enjoyed sailing in relatively clear air the rest of the pack fought it out for the minor positions. Fi Brown and the Grethe girls had been late arriving on the line and trailed the pack initially on the way down to No 13. They had made up ground by Mersea Wreck and then got lucky in the upriver section, sailing around several grounded boats (clearly growing up in Rowhedge has its advantages when it comes to local knowledge). Mike Hempstead in Gelasma is another man who knows the river like the back of his hand and used that knowledge to full advantage on the final approaches. Both Chris Matthews in Endeavour and Mark White in White Spirit found themselves struggling and much further back in the pack than usual. The fickle airs and mudbanks through Alresford, Wivenhoe and into Rowhedge took their toll on both boats. On the line Chris Rust claimed victory from Danny Fox with Alan Hicks third, Tom Sargent fourth and Mike Hempstead fifth. After a run ashore to enjoy the delights of Rowhedge and the Albion Pub it was all aboard again for the Downriver Race for the new Ian Brown Trophy, Presented by the family of Ian Brown who owned the boatyard in Rowhedge and was an enthusiastic supporter of Rowhedge Regatta as well as a BOD sailor as a young man. 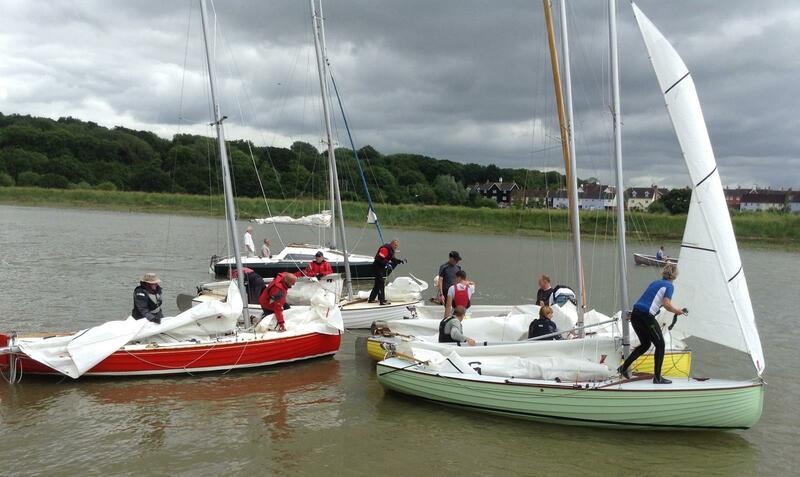 The downriver start produced some of the most exciting close quarters boat handling the BOD fleet has seen in years. Tom had wisely decided to sail home and avoid the melee (although he insists that he was actually the winner as he was “only just over” at the start and did not get recalled!). That left nine boats trying to fit into a river barely wide enough for six. Remarkable everyone managed to avoid contact and as the gun went the fleet shot off on the ebb with spinnakers flying in spectacular style. Once again the vagaries of the wind and vast expanses of mud caught plenty of people unawares during the initial stages of the race, but by the time they were through Alresford and on the final reach home it was champagne sailing all the way as the sun finally came out to welcome the fleet back to Brightlingsea where Marilyn Hempstead was kindly waiting at Bateman’s to record the finish. Danny Fox and the Egret boys got the upper hand this time and will be the first boat to have their name engraved on the new trophy, Mike Hemstead and Gelasma once again took full advantage of their local knowledge to finish second with Chris Mattews in Endeavour third, Mark White and White Spirit fourth and Mike, Trevor and Jim in Ruff fifth. Alan, Nicky and Jane in Storm Petrel were not so lucky on the downriver race and following a close encounter with the flats in Rowhedge and hitting the bank they trailed the fleet home just behind Chris in Dulcet, but ahead of poor Bob and his team in Panic who were having another nightmare race (see his separate report for the entertaining story of their return race and approach to the mooring). Overall a great time was had by all and we’d like to thank the Rowhedge Regatta organisers for once again inviting the BODs to be part of this very special day. We’d also like to say a big thank you to all the rescue boat teams that accompanied us up river and helped some of us get off the mud and moored up on arrival, and a great big thank you to Marilyn Hempstead for rushing back to Bateman’s to finish us and for the photos that accompany this report. As a final little aside we should also say huge congratulations to Dan and Laura Willett who got married in Wivenhoe on Saturday and whose celebration bell peel rang out just as the BOD fleet was sailing through. It was wonderful for the BODs to know we were there as they celebrated their union and we wish them all the very best for their future together. Rowhedge Regatta confirm that they will have more photos for us shortly so check back again for those soon.